What do you love most about working at Thos. Moser? Being able to work with so many people with such a great amount of experience and talent. Before coming to Thos. Moser, Geoff worked as a prosecutor in the state of California for 15 years. 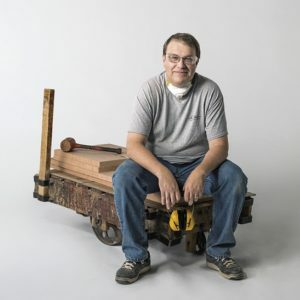 When he felt it was time to pursue something new, he decided to turn his hobby of building with wood into a living. As a participant in our four-year apprenticeship program, Geoff was able to learn most every concentration in our workshop. Today, Geoff spends most of his time working on dovetail joints but he has the skills to help out on other projects when needed. He loves being able to shift from one focus to another because of the variety it provides. Some of his favorite pieces to build are beds, desks and chairs. Geoff puts immense care into his work and strives for quality; his biggest challenge is completing projects quickly but with the utmost precision. In his free time, Geoff is happiest when he is spending time with his family. He also enjoys watching films, his favorite being Casablanca.